NOTE: Myungwan Kim 9P is doing live daily game commentaries at 10:30a and 5:30p EST (note updated times!) on the TygemGo Korea1 Server; some games are also being broadcast on KGS. For latest standings and game records, click here and scroll down to Results. Here are the full results of Tuesday’s games from the AGA-TYGEMGO Pro Finals. The name in ALL CAPS is the winner (color played, next match). 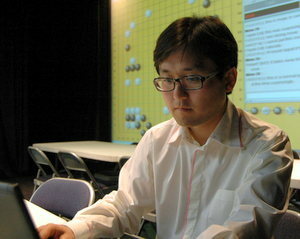 NOTE: Myungwan Kim 9P is doing live game commentaries at 10:30a and 5:30p EST (note updated times!) on the TygemGo Korea1 Server each day; some games are also being broadcast on KGS. For latest standings and game records, click here and scroll down to Results. Here are the full results of Monday’s games from the AGA-TYGEMGO Pro Finals being held in Black Mountain, NC. The name in ALL CAPS is the winner (color played, next match). Broadcast of the AGA-Tygem Pro Finals continues today, on both Tygem and, as of today, selected games on KGS as well. Myung-wan Kim 9P will provide live commentary starting at 10:30AM and 5:30PM (EST), an hour and a half after the games game start. 2A-D, second game; same players, colors reversed. Players have arrived at the YMCA Blue Ridge Assembly in Black Mountain NC for the first AGA-TygemGo Pro Finals. Play starts Sunday morning with two rounds a day starting at 9 a.m. and 4 p.m. ET. The plan is to broadcast four games in each round live in the AGA room on Tygem and then post game records of all the games, along with photos and the current tournament chart, each evening. The winners in the recent AGA-Tygem Online Pro Prelim were Soo-il Kim, Matthew Burrall, Eric Lui, Daniel Chou, Bill Lin, Will Gan and Juyong Koh. With the final qualifier over, invitations have now been sent out for the first AGA-TygemGo Pro Qualification Tournament, which will be held the week prior to the upcoming U.S. Go Congress. 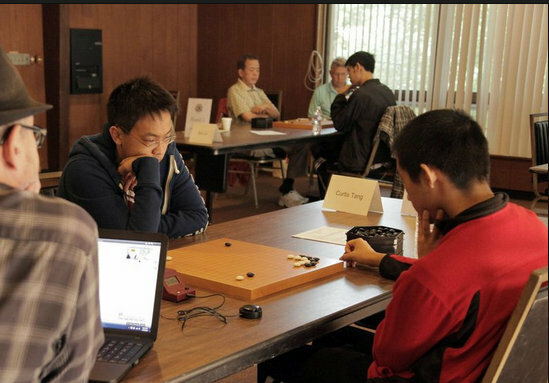 In addition to the Online Prelim winners, Cotsen winners Calvin Sun and Curtis Tang, Maryland Open winner Andy Liu and Seattle prelim winner Edward Kim have also been invited to compete in the Final. The Canadian Go Association selected Gansheng Shi and Jing Yang to receive invitations and the AGA picked Jie Li, ZhaoNian Chen and Danny Ko from its active high-ranked players. Curtis Tang, Calvin Sun, Gansheng Shi, Bill Lin and Jing Yang have already indicated they will play; stay tuned for updates. U.S.: Matthew Burrall, Wei Chen, Daniel Chou, Bert Hallonquist, Kevin Hong, Dae Kim, Sooil Kim, Ben Lockhart, Andrew Lu, Eric Lui, Daniel Puzan, Cherry Shen, Justin Teng, Aaron Ye, , Vincent Zhuang. Canada: Will Gan, Juyong Ko, Bill Lin, David Lu, Jing Yang, Oliver Wolf. If you didn’t sign up by Sunday’s deadline for the AGA-TygemGo Online Pro Prelim, there’s still time to participate in this historic tournament, joining over 100 who have already signed up. The registration deadline has been extended until midnight (EST) on Tuesday, June 5. 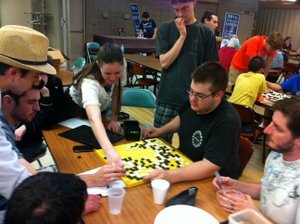 “I’m playing in the AGA-Tygem tournament so that I can say, ‘I tried to become a US Go professional’” says Devin Flake 11k, a Systems Administrator in Orem, UT. Monsoon Shrestha 18k, a student in Elmhurst, NY, signed up “To be part of history,” while Peter Freedman 2D, a retiree in Portland, OR, wants to “Support the new ground-breaking American pro system.” Sign up and click here to let us know why you’re playing. “This tournament is meant to include as many players as possible, regardless of rank,” says AGA chair Andy Okun. “Though it’s just a dream for most of us, contending for pro will be a moment of pride for all of us,” he added. Every player who participates will receive a high-quality enamel “Go for Pro” pin. The tournament will be played on Saturdays and Sundays starting June 9. 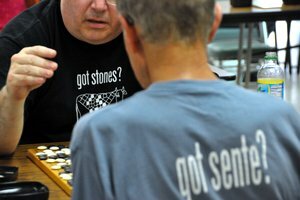 The online tournament gives both WMSG and NMT points. For further details, click here or email Okun at sponsorship@usgo.org or TD Yixian Zhou at missbear@gmail.com.